Make Your Own Aromatherapy Soap. Discover Recipes Using Essential Oils. 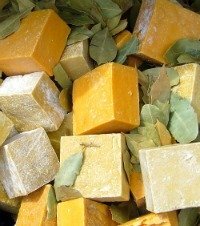 Make Your Own Aromatherapy Soap! Fancy making some homemade aromatherapy soap? There are lots of excellent reasons for doing this. You get to choose your favourite essential oil....or conjour up your own special blend of oils. You also know exactly what is going into your soap....natural ingredients which are much better for you and your skin. Maybe you want to treat your family and friends to homemade soap made with essential oils.....I always love being given presents that are homemade......to me this means thought, time and effort! The one trouble might be that you love the soap you've made so much that you want to keep it for yourself! There are several different ways to make aromatherapy soap, but the easiest one is probably the melt and pour method. You don't need much equipment, you don't need to spend a lot and you can see results quickly. This is the first method that I used - it was great fun and I was really impressed with the results! This would be a great way for children to learn how to make soap.....under supervision, of course, as hot melted soap can be dangerous. Some melt and pour soap base. (500g will give you roughly 3 to 4 bars of soap, depending on the size of your mould. Something to use as a mould. You can buy soap moulds and ingredients online. Or if you prefer, try a good crafts shop. A heatproof jug or bowl. A small fine spray bottle of rubbing alcohol (surgical spirit). Possibly some soap-safe dyes if you would like coloured soap! You will also need a little bit of time and some imagination......let's get going and make that aromatherapy soap! Step 1. Find a good melt and pour recipe that you would like to try and make a list of the ingredients......then go and buy what you need! Step 2. Cut the amount of soap you want to use with a sharp knife. It is better to have slightly too much than too little. Slice it into small pieces so that it melts quickly. Put the soap base into your jug, or bowl. Step 3. Microwave for 1 minute and check for melting. Continue to microwave in 15 second intervals until it has melted. It is important not to overheat it as this may discolour the soap. Be careful as the melted soap will be very hot! Step 4. Once melted, try to keep stirring the soap to stop a skin from forming.....you will have to work quite quickly from this point! Step 5. Now is the time to add your essential oil(s) and colouring, if using. If the soap starts to solidify then you can remelt it. Step 6. Fill your soap moulds with the melted soap, but not completely to the top. This makes it easier to remove the soap later. Tap the mould lightly to get rid of any air bubbles. If you do get some then just spray a little bit of alcohol on and this should get rid of them! Step 7. Leave the soap until it has hardened. You can put them in the fridge to help them set more quickly. Step 8. Remove the soap from the moulds. If you are keeping your homemade aromatherapy soap for any length of time then it is a good idea to wrap them. Cling film is ideal. If you are not sure how much soap you need, fill your moulds with water and then pour this into a measuring jug - this is roughly the amount needed! Remember to over-estimate the amount of soap. It's a good idea to have a spare mould that you can use for any leftover soap.....it can be used next time! Wash all your equipment by hand, not in a dishwasher. If there is too much soap left on your utensils then there will be too many bubbles for your machine to handle! You can also add all sorts of things to your aromatherapy soap such as oatmeal, honey, finely ground herbs......even liquidised fruit or vegetables! However, it is recommended to only add approximately 5% of extra ingredients as they do effect the final texture. I grow lavender, here in France, and so I like to add dried lavender flowers to some of my soaps. My Mum especially likes these! This soap is great for waking you up in the mornings! Cut up your melt and pour soap base into little pieces, place in a microwave safe bowl, cover with clingfilm and microwave until melted. Add drops of green dye, stirring, until you get a mint colour. Add and stir in the essential oils. Pour the soap into your moulds and put them somewhere safe to cool. Don't forget you can put them in the fridge to cool them more quickly. When the soap is completely cold and hard, remove the soap and enjoy! This is a two-stage aromatherapy soap....easy to make but impressive! It has a lovely, calming aroma - great for stress. Cut up your transparent melt and pour soap base into little pieces, place in a microwaveable bowl, cover with clingfilm and microwave until melted. Add drops of the purple (or violet) dye until you get a lavender colour you like. Add 10 drops of the lavender essential oil. Pour into a mould (the size and shape doesn't really matter) and let it harden. Remove the soap from the mould. Slice the soap using the side of a cheese grater.....you get a better swirl if you slice slowly and steadily. A variety of different sized swirls is fine! Arrange the swirls in the moulds you are using for the final soap and spray them with a little alcohol. Cut up your opaque melt and pour soap base into little pieces, place in a microwaveable bowl, cover with clingfilm and microwave until melted. Add the rest of the lavender essential oil and stir. Allow to cool slightly and then gently pour into the moulds with the swirls. Put the moulds somewhere safe to cool, and then remove when completely cold and hard. So, once you have tried a couple of simple aromatherapy soaps and got to grips with the basics, it is time to let your imagination run wild! It's fun creating and inventing new aromatherapy soaps.....it's probably a good idea to keep some notes on ones you particularly like so that you can make them again! So.....get creative and have some fun!